Watching an old episode of Mad Men the other night, the one where Don and Betty fly to Italy, I was reminded of the days when people used to dress up for air travel. No one wore baseball hats or flip flops or those shorts with your alma matter written across your bottom. Flying was itself an event and people recognized the luxury and dressed accordingly. So let’s be civilized for a moment and think through the perfect modern day travel ensemble. Starting with the luggage, I think it’s time to bring back the matching set. Normally, I don’t go for matchy-matchy, but in this case, I think it sends the message that you are a seasoned flyer who has made a point of investing in good luggage. Of course, I would choose something that had a retro vibe to up the ante on classiness. I started flying by myself at an early age and my grandmother, who would either be receiving me at the gate or sending me back home, had expectations on how a young girl should dress for travel. “You don’t ev-ah, ev-ah we-ah dungarees on an ai-ah-plane! No suh!” (She was from Maine so I’ve quoted her with a Maine accent). With that in mind, here’s a skirt that would satisfy my grandmother and still be comfortable, and it’s length means your legs are covered in defense of the overly air conditioned cabin. If you’re flying overnight, you might want to wear a camisole instead of a bra. It will be more comfortable to sleep in. Then, I’d choose a soft shirt with a pattern. These polka-dots would hide any spills you might make on your journey. And finally, I always wear an oversized scarf. It can go around my neck while I’m walking and be used as a lightweight blanket if I’m trying to sleep on the plane. 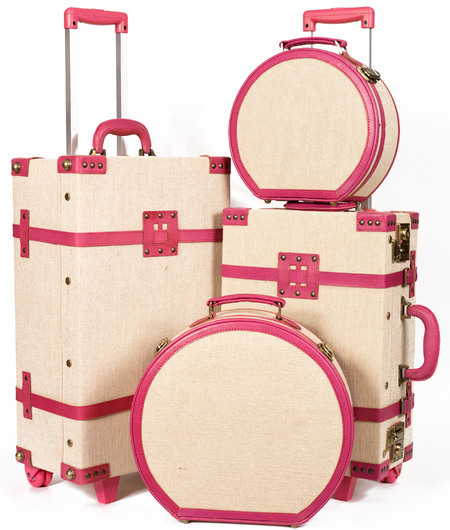 Alright, your bags are packed and you’re looking very stylish. Now, what’s on the itinerary? Back in the 1800s, young ladies would go on a “Grand Tour” with a chaperone, which consisted of spending several months in some of the major cultural cities of Europe. The point was to polish off their education (and with any luck, find a husband with noble blood). Minus the chauvinist backdrop, I wouldn’t mind having a fully paid-for Grand Tour of my own. If you had the opportunity to spend a year abroad with the sole purpose of improving your cultural IQ, where would you go? Let us know in the comment section below!